Today is a very exciting day for me. I am at OnStage Local in London, Ontario. 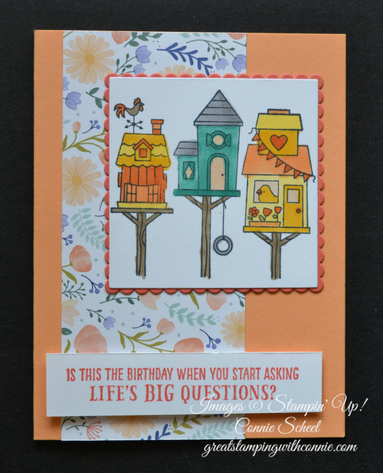 It is the spring Stampin' Up! conference for Demonstrators, and it is ALWAYS an amazing event. We get to spend the day with fellow stampers, can it get any better than that? Well yes, we share swaps, learn about stamping and business tips, and the new Annual catalogue will be revealed to us! There are also goody bags and prize patrol, so we come home with lots of great new products. This year is extra special for me, as I was selected to be a display board stamper. I have been able to create some projects with brand new items that will be unveiled in the new catalogue. These will be on display at the event to help inspire other Demonstrators. How great is that? You know I love to share projects with each of you, and I will show you all these projects in due course, but it is truly an honour to be able to introduce new items to other Demonstrators. If you would like to be at the next OnStage event, join my team and as a Demonstrator you can attend with me! Get more information about that here, and get in touch with me. I would love to have you on my team. I love to colour, and this stamp set has such great images for colouring. Of course anything with birds also makes me think of Spring, and I want to encourage the warm weather to start, so this set is perfect! Connie Scheel April 10, 2018 Retiring List, Stampin' Up!